Seagate has shipped over 10 Million storage HHDD’s, is that a lot? Recently Seagate made an announcement that they have shipped over 10 million Hybrid Hard Disk Drives (HHDD) also known as Solid State Hybrid Drives (SSHD) over that past few years. Disclosure Seagate has been a StorageIO client. What is a HHDD or SSHD? The HHDD’s continue to evolve from initially accelerating reads to now being capable of speeding up write operations across different families (desktop/mobile, workstation and enterprise). 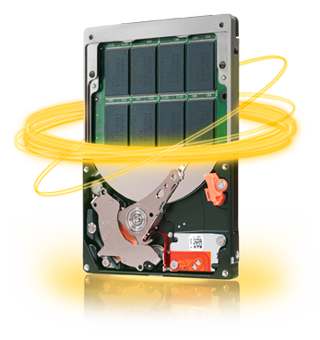 What makes a HHDD or SSHD is that as their name implies, they are a hybrid combing a traditional spinning magnetic Hard Disk Drive (HDD) along with flash SSD storage. The flash persistent memory is in addition to the DRAM or non-persistent memory typically found on HDDs used as a cache buffer. These HHDDs or SSHDs are self-contained in that the flash are built-in to the actual drive as part of its internal electronics circuit board (controller). This means that the drives should be transparent to the operating systems or hypervisors on servers or storage controllers without need for special adapters, controller cards or drivers. In addition, there is no extra software needed to automated tiering or movement between the flash on the HHDD or SSHD and its internal HDD, its all self-contained managed by the drives firmware (e.g. software). Jim Handy over at Objective Analysis has this interesting post discussing Hybrid Drives Not Catching On. The following is an excerpt from Jim’s post. Why were our expectations higher? There were a few reasons: The hybrid drive can be viewed as an evolution of the DRAM cache already incorporated into nearly all HDDs today. Replacing or augmenting an expensive DRAM cache with a slower, cheaper NAND cache makes a lot of sense. An SSHD performs much better than a standard HDD at a lower price than an SSD. In fact, an SSD of the same capacity as today’s average HDD would cost about an order of magnitude more than the HDD. The beauty of an SSHD is that it provides near-SSD performance at a near-HDD price. This could have been a very compelling sales proposition had it been promoted in a way that was understood and embraced by end users. Some expected for Seagate to include this technology into all HDDs and not to try to continue using it as a differentiator between different Seagate product lines. The company could have taken either of two approaches: To use hybrid technology to break apart two product lines – standard HDDs and higher-margin hybrid HDDs, or to merge hybrid technology into all Seagate HDDs to differentiate Seagate HDDs from competitors’ products, allowing Seagate to take slightly higher margins on all HDDs. Seagate chose the first path. The net result is shipments of 10 million units since its 2010 introduction, for an average of 2.5 million per year, out of a total annual HDD shipments of around 500 million units, or one half of one percent. Continue reading more of Jim’s post here. In his post, Jim raises some good points including that HHDD’s and SSHD’s are still a fraction of the overall HDD’s shipped on an annual basis. However IMHO the annual growth rate has not been a flat average of 2.5 million, rather starting at a lower rate and then increasing year over year. For example Seagate issued a press release back in summer 2011 that they had shipped a million HHDD’s a year after their release. Also keep in mind that those HHDD’s were focused on desktop workstations and in particular, at Gamers among others. The early HHDD’s such as the Momentus XTs that I was using starting in June 2010 only had read acceleration which was better than HDD’s, however did not help out on writes. Over the past couple of years there have been enhancements to the HHDD’s including the newer generation also known as SSHD’s or Turbo drives as Seagate now calls them. These newer drives include write acceleration as well as with models for mobile/laptop, workstation and enterprise class including higher-performance and high-capacity versions. Thus my estimates or analysis has the growth on an accelerating curve vs. linear growth rate (e.g. average of 2.5 million units per year). However IMHO there is more to the story beyond numbers of HHDD/SSHD shipped or if they are accelerating in deployment or growing at an average rate. Some of those perspectives are in my comments over on Jim Handy’s site with an excerpt below. In talking with IT professionals (e.g. what the vendors/industry calls users/customers) they are generally not aware that these devices exist, or if they are aware of them, they are only aware of what was available in the past (e.g. the consumer class read optimized versions). I do talk with some who are aware of the newer generation devices however their comments are usually tied to lack of system integrator (SI) or vendor/OEM support, or sole source. Also there was a focus on promoting the HHDD’s to “gamers” or other power users as opposed to broader marketing efforts. Also most of these IT people are not aware of the newer generation of SSHD or what Seagate is now calling “Turbo” drives. When talking with VAR’s, there is a similar reaction which is discussion about lack of support for HHDD’s or SSHD’s from the SI/vendor OEMs, or single source supply concerns. Also a common reaction is lack of awareness around current generation of SSHD’s (e.g. those that do write optimization, as well as enterprise class versions). When talking with vendors/OEMs, there is a general lack of awareness of the newer enterprise class SSHD’s/HHDD’s that do write acceleration, sometimes there is concern of how this would disrupt their “hybrid” SSD + HDD or tiering marketing stories/strategies, as well as comments about single source suppliers. Have also heard comments to the effect of concerns about how long or committed are the drive manufactures going to be focused on SSHD/HHDD, or is this just a gap filler for now. Not surprisingly when I talk with industry pundits, influencers, amplifiers (e.g. analyst, media, consultants, blogalysts) there is a reflection of all the above which is lack of awareness of what is available (not to mention lack of experience) vs. repeating what has been heard or read about in the past. What about SSHD and HHDD performance on reads and writes? What about the performance of today’s HHDD’s and SSHD’s, particular those that can accelerate writes as well as reads? Additional details and information about HHDD/SSHD or as Seagate now refers to them Turbo drives can be found in two StorageIO Industry Trends Perspective White Papers (located here and another here). Refer to the following links to learn more about HHDD and SSHD devices. Part II: How many IOPS can a HDD, HHDD or SSD do with VMware? I continue to be bullish on hybrid storage solutions from cloud, to storage systems as well as hybrid-storage devices. However like many technology just because something makes sense or is interesting does not mean its a near-term or long-term winner. My main concern with SSHD and HHDD is if the manufactures such as Seagate and WD are serious about making them a standard feature in all drives, or simply as a near-term stop-gap solution. What’s your take or experience with using HHDD and/or SSHDs?